I was once at a talk given by Roger Penrose. We were told about Penrose's many achievements such as twistor theory by the chairman who suggested that we might hear more about these during the talk. "Afraid not" was Penrose's reply - the talk was on his ideas of consciousness and quantum theory. Well if anyone was disappointed by that then perhaps they should read this book, which does indeed get on to twistor theory. It has to be said that, in terms of his publications, Penrose has something of a double life. The books he is probably best known for are "The Emperor's New Mind" and subsequent books, but these are essentially concerned with his highly speculative ideas, and I don't think that even Penrose himself believes them totally. It seems that those who reach the dizzy heights of the "Professor Sir" title feel that they have earned the right to a little speculation. However, "The Road to Reality" is much more mainstream . I have to say that this book wasn't quite what I had expected. I had thought it would be a grand tour of modern physics, but aimed at the popular science readership. In fact the first sixteen chapters are mathematical. In a way this is strange because even a book of over a thousand pages isn't going to teach you all the maths you need to understand modern physics, but actually the book works very well - as long as you're not too hung up about the maths which you don't understand. This book isn't a textbook, in which a failure to fully understand the earlier chapters would make it impossible to read the later chapters. Rather, although the maths may get fairly deep in one chapter, it isn't vital to the understanding of later chapters. I would say that the main benefit of this book is Penrose's geometrical intuition. Such intuition has been a vital part of physics, particularly since Einstein and General Relativity, and Penrose clearly counts as an expert geometer. Next to anything mathematical in this book there is invariably a picture of his interpretation of the geometry of the situation. It is this which enables you to progress through the book without understanding all of the maths - what you get is an intuitive feel for what is going on (which is actually much more important to most mathematicians than the details of mathematical proofs). This point of view is somewhat different to that taken in many university mathematics courses which are based on axioms and set theoretic ideas. For instance mathematical topology doesn't appear much in this book despite being the basis of some of Penrose's work on singularities, and I think that the reason for this is that topology is defined in terms of set-theoretic axioms. Those who have read Penrose's other works will know that he believes in the Platonic notion of mathematical ideas being 'out there', indepently of how they are axiomatized, and this point of view is very much present in this book. Following the sixteen mathematical chapters there are four on classical physics and relativity, then six on quantum theory. This includes the motivation for Quantum Field Theory, which is a very useful part of the book. Whenever I've tried to study QFT I've found that it really is very hard to get any intuitive feel for 'what is going on'. To my mind the area is something of a mess, and needs someone to try to provide a consistent explanation of the theory. This book provides at least a start in this direction. Who knows maybe The Road to Reality will be the inspiration of whoever does finally sort out quantum theory and QFT. After the quantum theory chapters there is a chapter on the Big Bang and early universe. After that book goes into more speculative areas - or at least what Penrose considers to be speculative, for instance inflationary cosmology. There are two chapters discussing the quantum measurement problem. Despite what I have said earlier about this book being mainstream physics, some of his own speculative ideas are included, in particular the Objective Reduction of the quantum wavefunction due to general relativistic constiderations, and its links to consciousness. However, he is not trying to sell these ideas so much in this book - he admits that they are speculative. Following this is a discussion of three possible routes to the unification of quantum theory with general relativity - these are string theory, loop quantum gravity and Penrose's own Twistor theory. Although string theory is considered by many to be the theory of quantum gravity, Penrose is very doubtful, and gives plenty of reasons why he doesn't believe it will work. 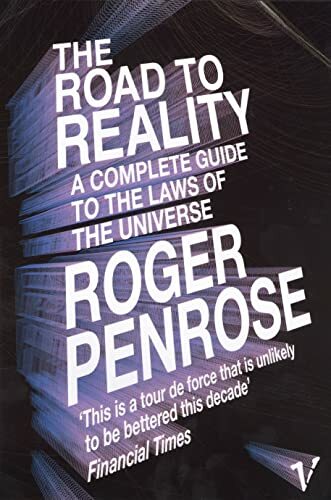 The book ends with a non-mathematical chapter 'Where lies the road to reality', which is a discussion of the possible future paths for physics. I think that this book is suitable for anyone who has studied mathematics and physics to an advanced level at school - it would make an ideal gift for someone starting the study of these subjects at university. I wouldn't recommend anyone trying to slog through the book, trying to understand it all at the first go. Rather it is a book to be read through once, not necessarily understanding the maths, but rather getting a flavour of it from the geometrical illustrations. Then it can be used as a map of mathematical physics - as you come to a subject you want to study in more detail you can go back to the treatment of it in this book and remind yourself of 'what is really going on' as well as finding references to learn more about it. If you really aren't into maths then this isn't the book for you, but you shouldn't be worried that you don't know enough yet. Whether you go for this book shouldn't depend on how much maths you know now, but rather how much you are planning to learn in the future.